Greenfield Style 2 Model Hawaiian Acoustic Guitar (1931), made in Edmonton, Alberta Canada, natural varnish finish, Koa wood body, black canvas case. This Greenfield Style 2 is one of the more unique creations to emerge from the Hawaiian guitar craze of the 1920s, hailing from the unlikely home of Edmonton, Alberta in Canada. The Greenfield brothers were local cabinetmakers who also played guitar. Soon enough, they decided to craft instruments for themselves and then for sale as well. They initially tried making a symmetrical extended body that completely surrounded the neck; that proved to be impractical as the player's steel kept banging into the treble side of the top. Their solution was to leave the hollow body extension only on the bass side, resulting in an asymmetrical but attractive offset design (nicknamed "The Hambone" at the time) unique to themselves. Constructed of varying cuts of Hawaiian koa with a subtly flamed top and all-wood binding, this is a very well-made and striking looking creation. The Greenfields were not exactly modest about their instruments; the area under the sound hole has not only a large color label (proclaiming the guitar "HAS NO RIVAL" and guaranteeing it for all of one year) but patent stamps for the US and Canada and the maker's hand signature and date. One small stamp reads "Proclaimed by Canadian and USA artistes of repute as the world's best Hawaiian guitar". This is a very good-sounding instrument, not dissimilar in tone to the Weissenborn and Kona guitars out of Los Angeles but with a distinctive character all its own. By the time this one was made in April 1931, the unamplified Hawaiian guitar was soon to be supplanted by the new electric models, quickly rendering these dedicated wood-body steel acoustics essentially obsolete as professional instruments. Lovely, unique, and definitely a show stopper, the Greenfield is one of the lost gems of the pre-electric Hawaiian guitar world. Overall length is 36 in. (91.4 cm. ), 13 in. (33 cm.) wide at lower bout, and 2 3/4 in. (7 cm.) in depth, measured at side of rim. Scale length is 25 in. (635 mm.). Width of nut is 1 7/8 in. (48 mm.). Very fine overall, showing some very light finish dings and scrapes but few signs of actual use. 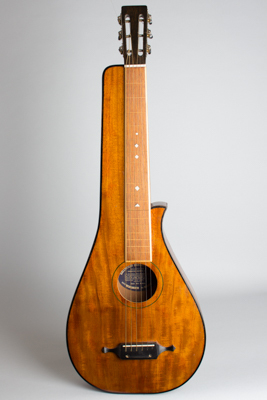 As is typical of many of these early dedicated Hawaiian instruments, the very thin top is lightly braced and has taken some curve to it over time but is stable and the instrument sounds very fine. There are a few re-sealed seams but no cracks, which is unusual for a koa instrument of this vintage. The tuners appear to have been replaced sometime around the 1960s with Japanese machines similar to the originals; otherwise, the guitar remains all original. A truly unique instrument, and a surprisingly practical player as well! Excellent - Condition.